Amazon is offering up a $10 credit when you buy $60 worth of select natural products! Pampers Pure, Always Pure, Tampax Pure, Tide PurClean, Gain Botanicals Plant Based laundry detergent, Vicks ZZZQuil Pure and more products are included in the sale. I didn’t even know most of these brands started making natural and plant-based products, so I’m excited to see that they see the need for these products! Once you add $60 in qualifying items to your cart, you’ll get a confirmation at checkout that you you’ll receive a $10 credit. There are several coupons on the Always Pure and Tampax Pure products, that I confirmed you can stack with this offer! 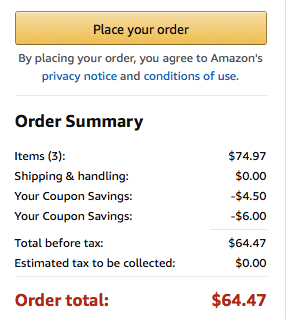 Just be sure you have $60 in items added to your cart, after the coupon discounts. Check out all of the products included in the sale here.